According to The Credit Suisse Research Institute’s 2013 study, “Sugar: Consumption at a Crossroads”, 30 to 40 percent of U.S. healthcare costs are dedicated to treatment of diseases that are linked to over-consumption of sugar! As compared to other industrial countries, the United States spends two and a half times MORE on healthcare per capita. Wouldn’t it seem as though we would have some of the healthiest citizens in the world? Actually, the reverse is true. The recent analysis prepared by the National Research Council and Institute of Medicine, U.S Health in International Perspective: Shorter Lives, Poorer Health reveals that Americans are less healthy and live shorter lives than those living in 17 other developed nations. Even those who have followed the Dietary Guidelines from the USDA from the former Food Pyramid and current MyPlate, which recommends a including more whole grains, fresh fruits and vegetables, high fiber, a limited amount of lean meat, eggs and lowfat dairy, some sugar, and polyunsaturated fats found in vegetable oils have not found success in rising above chronic health issues. Although there are multiple factors in poor health, sugar has been one of the most prominent downfalls in our “progression” as a developed nation. One of the reasons we have so much trouble with sugar is because it is pervasive in the modern food supply – especially if you consume the Standard American Diet. Sugar cravings are usually a sign of nutritional deficiencies, candida or yeast overgrowth, and metabolic imbalances. 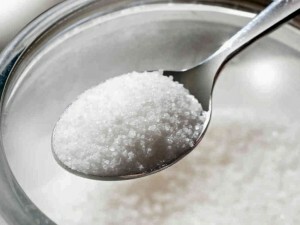 Sugar consumption greatly compromises our digestive and immune system health. The hard part is, the more sugar and refined carbohydrates you consume, the more you’ll crave. In her article Zapping sugar cravings, Jen Allbritton writes: “sugar begets more sugar”. Sugar is a culprit in obesity and diabetes, and contributes to heart disease and cancer. Even if you don’t have a weight problem, you could be consuming more sugar than you should be. For a complete list, see 146 Reasons Why Sugar Is Ruining Your Health by Nancy Appleton, PhD. So how do you stop the vicious cycle of sugar cravings? 1. Keep a food journal and record what you are eating for one week. Make as many changes as you feel comfortable with at a time, but know that completely removing sugar for one week or longer will provide optimal benefits … benefits may have not realized were possible. Review your journal daily. Journaling forces us to look at and compare what we’ve been doing on a day-to-day basis. You may be surprised at what you have been eating. Continue your journal beyond a week and notice how many other changes occur as time moves on. 2. Start replacing refined snacks such as chips, crackers, processed breads, cereals, pretzels, rice cakes, protein powders and “food bars” with real foods. Recommended: organic cheeses (raw is optimal), sprouted nuts, grassfed meats, pasture-raised poultry or fish. When you find yourself going for the unhealthy variety, eat the healthy alternatives instead. When your body tells you it wants sugar, it usually means it needs the nutrients found in foods which contain traditional fats. Polyunsaturated fats, which can be found in many processed foods including bread, cereals, crackers, rice, pasta and others do not provide our bodies with critical nutrients found in real, traditional fats. They are also usually rancid on the shelf from high heat processing, and many are produced from genetically-modified sources. Think canola oil, soybean oil, corn oil, and cottonseed oil. When you resolve sugar cravings and heal your digestive tract, which can take some time, you can once again consider eating potatoes and preparing sprouted rice, and traditionally-prepared grains including soaked hot cereals or real sourdough bread. However, returning to processed versions of these foods you once consumed before resolving sugar cravings can send you right back where you started. I recommend How We Get Fat by Gary Taubes for additional reading on this subject, via Amazon. 3. Eat natural pasture-raised meats and poultry, and eggs from hens on pasture. Animal foods from creatures raised on feedlots and fed corn, grain, and soy are out-of-balance nutritionally since those animals are not intended to eat grains, soy, and corn. Feedlot animal foods also contain antibiotics which upset the delicate balance of friendly gut flora or bacteria and can contribute to the cause of sugar cravings. Pasture-raised meats contain the correct ratio of Omega 3 to Omega 6 essential fatty acids. 4. Include homemade broths from the bones of the meat and poultry you consume. Broths are highly nutritious, healing of the digestive tract, and supportive of optimal health. Broths also contain L-Glutamine, an amino acid which can help seal the gut and resolve Leaky Gut, a condition which occurs when the foods you eat penetrate the walls of the digestive tract and enter the bloodstream. This condition contributes to many other health issues including food allergies and sensitivities, auto-immune disorders, yeast overgrowth, and sugar cravings. 5. Julia Ross, author of The Diet Cure, believes that most individuals with chronic sugar cravings experience a deficiency in L-Glutamine. L-Glutamine, a neurotransmitter or brain booster as she calls it, is in short supply in a person with sugar cravings. In her book, she explains that for a majority who struggle with sugar cravings, dietary changes alone may be insufficient during initial stages of resolving cravings. She recommends supplementing with L-Glutamine to stabilize blood sugar levels and mood, and to help resolve sugar cravings. I personally had excellent results with and recommend Biotics Research L-Glutamine. Julia recommends taking 500 milligrams 3 times daily between meals. For more information about how to balance L-Glutamine and other neurotransmitters in your body, I highly recommend reading The Diet Cure by Julia Ross via Amazon. This is an excellent reference for all things health-related. 6. Find a type of exercise or movement you enjoy and can engage in for 20 to 30 minutes 3 – 4 times a week. If you haven’t engaged in regular exercise previously, start slow and go easy. Although exercise can lower insulin levels, helps keep blood sugar even, and can reduce sugar cravings, it can also damage your adrenal glands which may be exhausted from poor dietary and lifestyle habits. You don’t have to run marathons or lift weights competitively to benefit from regular, moderate activity. Walking is a good choice with which to start. 7. Include fermented foods, those which contain natural probiotics, in your diet. Recommended: raw dairy foods including home-made yogurt, kefir, sour cream, buttermilk, or other fermented foods such as home-made sauerkraut or beet kvass. These foods not only provide necessary and beneficial bacteria to our digestive systems, but support strong immunity as well. These living foods contain bacteria, enzymes, vitamins, and minerals that help prevent disease and chronic health issues. 8. Consider taking a good quality, therapeutic-grade probiotic. BioKult, Ther-Biotic Complete from Klaire Labs, BioDoph 7 plus by Biotics Research brand, Prescript-Asisst, or HLC Pharmax High Potency Capsules, are reputable brands I recommend via Amazon that provide diverse bacteria numbers, which are important for optimal gut health. Although fermented foods are also important for optimal digestive and immune system health, anyone who is coming off a diet high in refined foods and sugar can greatly benefit from support with a quality probiotic to restore proper gut flora balance and strong immunity. 9. Include fermented foods and beverages in your diet. Be sure to eat healthy fats with your vegetables – home-made salad dressing with salads and butter, coconut, or olive oil with cooked. Eliminated bottled and packaged dips, toppings, and salad dressing as they contain sugar, MSG and other excitotoxins, and other dangerous chemicals. 10. Make sure to you have a real food-source of Vitamins A and D.
Besides pastured animal foods, fermented cod liver oil from Green Pasture Products is, in my opinion, the only cod liver oil supplement worth using. Vitamins A & D are critical for all aspects of health and are found in traditional animal foods which may be lacking in your diet if you’ve been a sufferer of sugar cravings. 11. Obtain adequate rest and stress relief daily. Go to bed at a regular hour, preferably before 10:00 p.m. Substances including Splenda, Aspartame, Saccharine, high-fructose corn syrup and any type of corn syrup are highly-refined, genetically-modified. These products will continue to add to sugar cravings, disturb metabolism and blood sugar levels, and can cause long-term health issues in the same way sugar can, only much worse. For more information on how sugar causes blood sugar imbalances, weakened immunity, behavior problems, and mineral depletion, read Jen Allbritton’s article posted on The Weston A. Price Foundation, Zapping sugar cravings. Have you managed to reduce or eliminate sugar cravings? How did you do it? Such great do-able tips Raine! Sugar is a big time problem these days – I can’t believe how much our children are bombarded with on a weekly basis! This is a great reminder to be mindful of how our meal plans look for the week – it is so easy for it to sneak in! All excellent tips here! Thank for sharing. Hi Krystal – thank you for your visit! What a wonderful list. I am not a fan of fermented foods except yogurt. I wish I was. I also take L-Glutamine but not 3x a day. I need to rethink this. Hi Anna – I find the work of Julia Ross (who recommends L-Glutamine) to be fascinating and really helpful. I’ve seen her speak at The Wise Traditions conference and just listening to her talk really provided inspiration for for better health. Her books The Diet and Mood Cures are both really interesting and I highly recommend reading them. This makes me sad. We are a nations of addicts and it takes a lot of discipline to resist. Your suggestions are perfect and so helpful though! This is great! I just had someone tell me about #5 today – but in regards to it helping heal the gut lining. I don’t know much about it, but I think this might be one I need to take. Thanks for this info Raine. Hi Emily – I think the L-glutamine component is fascinating! I did have good results, but it may not be a solution for everyone. I don’t take a lot of supplements anymore, but back when I was taking this I was using a lot of others as well. I think anything that happens is a result of a combination of efforts of many different things. I didn’t know that L-glutamine helps with this issue! It took me years to get over my sugar craving and your article is the approach I took. It worked great but I think my candida overgrowth made it slow going. High fat broths really helped and never cheating. Thanks for recommending Biotics Research L-Glutamine. Great to know!! Hi Megan – It’s great that you were able to overcome your sugar issues, and now help others do the same. Candida can definitely put a wrench in that, for sure! I agree that high fat really does the trick! Really great tips! Once you get through the first withdrawal phase, I find that “out of sight, out of mind” works the best. I don’t crave sugar and junk food unless it is in front of me, so I keep it out of the house and don’t have to worry! Just need to make sure I’m prepared when we go out. Hi Chloe – I agree that it’s definitely tough in the beginning and keeping those temptation items out of sight is the best remedy. We pretty much don’t keep junk food in the house, but when it makes our way into the kitchen on rare occasions, I no longer find that I want it, so it’s not an issue for me. My son and husband do sometimes, but they have come such a long way from where they were, I am SO proud of them and happy to say they eat well 90% or more of the time. Great article! I think #1 and #12 are so vital for those getting started fighting their cravings. Pinning and sharing! Hi Dena – thank you for sharing!